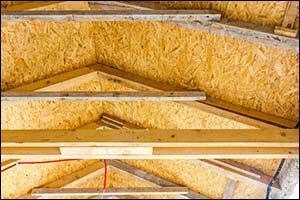 How to Get Proper Attic Ventilation: Norton Roofing Solutions | Boss Services Inc. If your residential building remodeling project includes a roof installation in Norton, Massachusetts, or anywhere in the surrounding area, make sure that you are getting effective attic ventilation with your new roof. It is important to hire a roofing company that knows the ins and outs of proper roofing and not just some “handyman” who doesn’t have a lot of experience working with Massachusetts roofs. Your Norton roofing contractor needs to pay special attention to attic ventilation to prevent a whole host of potential pitfalls that could occur if your home isn’t properly protected. Unvented roofing can have issues with moisture rising up through the structure within the attic area. This can cause damage to the insulation, the structure studs and other essential materials. The scope of the damage caused by not having effective attic ventilation can get really expensive very fast. A properly vented attic allows moisture to escape through a system of intake and exhaust that results in a healthy flow of air. Effective attic ventilation is important for year-round benefits and should be used with all types of roofing systems, regardless of your home’s location. Your Norton roofing contractor should already know about creating proper ventilation for your attic. However, it is important for you to understand why ventilation is key to a successful roof installation in Norton and the surrounding Massachusetts area. When attics are cooler in the summer and drier in the winter, they can protect your home from potential damage. This also helps to reduce energy consumption, making your HVAC system more efficient. Effective attic ventilation, when part of your residential building remodeling and roofing project, also helps to prevent the formation of ice dams, which can cause major structural damage. It is very important to have a proper flow of air in order to produce changes in the air that will prevent moisture from forming inside the attic. Proper residential building remodeling and roof installation in Norton is required to achieve effective attic ventilation. All of the components must be designed and installed properly in order to create a constant move of air throughout the entire attic area for best results. The air can be moved using either a natural flow of air or through a mechanical ventilation system. Your Norton roofing contractor can suggest options based upon the design of your home and your unique ventilation needs. The “Stack” Effect – This happens because heated air is actually lighter than cold air. When warm air rises it causes the pressure within the attic to increase in the upper portion of the space and to decrease in the lower portion of the space. To counter this effect, exhaust vents should be placed near the ridge of the attic and intake vents should be placed in the soffit or near the roof’s edge. The “Wind” Effect – In addition to the stack effective, wind force is important in the design of a ventilation system that does not require mechanical assistance. A wind-driven flow of air against the exterior surface of the structure helps to create areas that consist of both low and high pressure. The high pressure area forces air into the attic to provide fresh air, while the low pressure area pulls the air back out, completing the cycle of effective attic ventilation. Homeowners who are doing residential building remodeling that includes roof installation in Norton and the surrounding Massachusetts area should contact Boss Services, Inc. for quality roofing and effective attic ventilation. Contact your local Norton roofing contractor by calling (508) 297-0635 to get QUOTE on roofing services in Massachusetts.